At the September 28, 2008 “presentation to the City Council, Calthorpe Associates principal Peter Calthorpe suggested that PRT might solve any traffic woes that SunCal’s plans to build 6,000 housing units might bring to Alameda. The PRT would run on an elevated track from Alameda Point and connect commuters to Jack London Square across the Oakland Estuary. See the Alameda Sun article for further details. A system sketch of the proposed Alameda Point PRT network (Orange-Red: 13 miles guideway, 17 stations, 65' Rail Lift Bridge Crossing). In addition to providing a congestion free mode of transport, ULTra PRT makes carpooling and other transit more effective by solving the “last mile problem.” PRT also enables longer bike commutes and shopping trips, offering added flexibility to both residents and visitors. 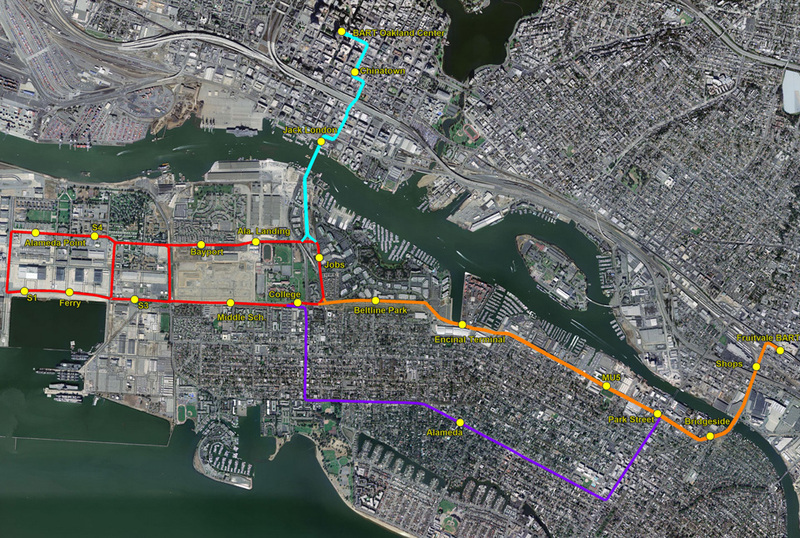 Additional Alameda stations may also be created along the Purple route. The Blue route could ultimately link to Downtown Oakland, Oakland Chinatown, and Jack London Square, or to Lake Merritt BART.